Cross posted on Shelly Terrell's blog, teacherrebootcamp.com by Guest Blogger Brad Hanks. Note: All views expressed and resources shared by this blogger are not necessarily supported or endorsed by Teacher Reboot Camp. Part of the Cool Sites series! Lucidchart is the best free learning tool you’ve never heard of. It’s an online diagramming tool that’s easy to use and supported by a for-profit company, so you don’t have to worry about us disappearing once you’ve built your lesson plans around us. Not sure how to use a diagramming program in your classroom? 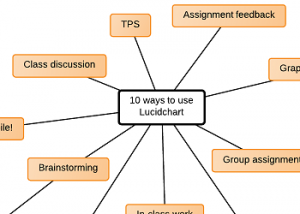 Here are 10 ideas from teachers and professors who are already using Lucidchart. It can be difficult to corral a class full of excited learners, but it’s much worse when your students are apathetic about classroom participation. Lucidchart tackles both of these problems with our real-time collaboration. The new technology captures students’ attention and encourages them to focus on the task at hand. At the same time, each contribution has equal weight, and every child’s voice is represented when they work in the editor. You’ll end up with an energetic-yet-structured class discussion that kids will love. Think, Pair, Share is a common classroom technique that can bring shy students out of their shells and engage the entire class. With Lucidchart, each response shared by students can be easily organized into one Lucidchart document. Real-time collaboration means that edits are synced instantly and immediately visible to everyone on the doc, so no time is wasted while passing out papers or compiling feedback by hand. Everything is saved to our secure data centers, so you can refer to past exercises at any time. And if you’re incorporating Think, Pair, Share activities into future lesson plans, you can create custom templates for reuse. When a student works hard on a project, they want feedback, and they want it fast! Lucidchart gives teachers the ability to view their students’ progress as it happens, and to offer feedback with minimal turnaround time. Utilize our in-editor comment and chat functions to clarify, critique, and communicate with your students. If they’re not online, they’ll see your comments upon login. Graphic organizers are a great tool to visually explore concepts. You don’t have to settle for outdated or irrelevant graphic organizers. We just introduced over 50 new graphic organizer templates, based on user feedback and designed specifically for education. These templates can be used as is or tailored to your classroom’s unique needs. The best part? You can print them, just like traditional graphic organizers, or you can go completely paperless by publishing your graphic organizers to a blog, wiki, image file, or a unique webpage hosted on our site. Even if you strip away Lucidchart’s collaboration features, it’s still a sophisticated tool for independent learning. Students will enjoy playing around with Lucidchart’s design options, which allow customization of colors, borders, text, and even the size of the canvas. Our tool empowers kids by giving them full control over their learning environment. They’ll love the slick interface and intuitive nature of our software and their confidence will grow along with their proficiency. Group projects are perfect for strengthening social skills. When students use Lucidchart for group projects, they can collaborate from any location, with any browser, on any device. Rather than try to arrange meeting times and dates, students can streamline group projects with the live chat and in-editor comments. You may even find yourself expanding the breadth and depth of group projects, since Lucidchart can accommodate an unlimited number of collaborators. Before your students reach for a pen and paper, have them fire up their laptops (or tablets, or phones, or desktop computers) and log their thoughts with Lucidchart. Mind mapping software is easier with Lucidchart because we offer a mind map tool that responds fluidly to keyboard shortcuts. You can easily add new shapes, text, and sub-topics. We’ve also incorporated auto-layouts and easy collapsing of mind map branches to make your diagrams simple and structured. Lucidchart comes equipped with ready-made Venn diagram templates, including 2-, 3-, and 4-circle Venn diagrams. Teach simple set theory and syllogisms, or get even more complex with multi-circle Venn diagrams. Our software helps your text and shapes snap into place, so things will never get crowded or confusing. Your diagrams will come alive when you customize them with bright colors and images. And no matter how complex your diagram gets, you can always expand the canvas for more space. With so many schools trying out 1:1 technology initiatives, we knew that a great mobile experience was important to educators. That’s why we developed a seamless iPad experience for Lucidchart, so you can view and edit diagrams from anywhere. You can incorporate visual learning whether your students are sitting in a classroom, learning about biology in an outside lab, or touring a historical building during a field trip. It’s easy to tie assignments together and explore cross-curricular studies when you have a flexible, inspiring tool like Lucidchart in your back pocket. Do your students maintain a class blog or wiki? Add Lucidchart diagrams with the click of a button. Do you want to create a Pinterest board for your school district? Convert your diagram into a PDF, PNG, or JPEG and pin it. We’ve seen students sharing documents on Twitter, Facebook, Tumblr, and personal websites, and you can always host your doc on a permanent Lucidchart web page. You can help your students understand that learning isn’t meant to stay in the classroom. We hope that you’ll leverage this powerful free tool to foster confident, adventurous digital learners. Please remember that you will only have access to our educational templates once you’ve signed up for a trial account and your educational upgrade has been approved. Try any of these ideas with your students and let us know how they worked!